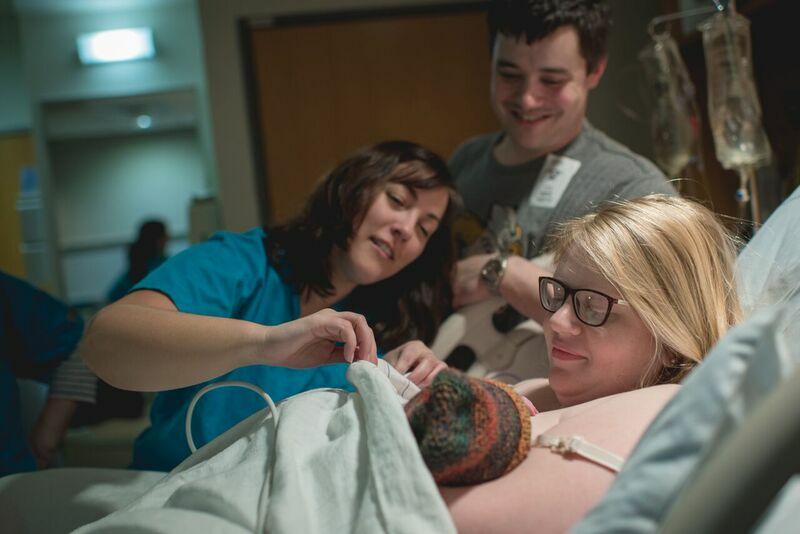 Here are some facts about midwifery and some questions we often hear from patients. A Certified Nurse Midwife (CNM) is a nationally certified registered nurse with experience in women’s healthcare. They also have special education, often at the master’s degree level, in midwifery. Many people think ‘home’ when they hear the word ‘midwife’. However, most midwives practice midwifery within a hospital system. Who do midwives work with? When needed, CNMs consult and collaborate with other healthcare specialists within the healthcare system. At UNC, these include the physicians, nurses, nutritionists, social workers, and a full array of available specialists. The hallmarks of midwifery care are continuity and education.Our division at UNC is dedicated to supporting your choices in healthcare by providing you with up-to-date information for making informed decisions. The midwives at UNC will guide you through all your experiences, supporting you during pregnancy, your birth in the hospital, the first time you use a new contraceptive method, or when considering choices about hormone replacement therapy. We also specialize in first time female exams. We are your partners in healthcare and consider ourselves an alternative to physician care, not a substitute. What services do UNC Midwives provide? Our midwives focus on individualized care and education for healthy women throughout the life cycle. This includes preconceptional counseling, prenatal care, labor and delivery care, immediate infant care, and postpartum care. Midwifery services also include family planning, well-woman gynecology exams (annual pap smears and breast exams) as well as care for women transitioning through peri- and post-menopause. Midwives are primary care providers who can also care for minor illnesses such as upper respiratory and bladder infections as well as minor gynecological problems such as vaginitis. We are able to prescribe medications for your health care needs. During labor we work with an anesthesiologist if you desire an epidural. Midwives provide a constant presence, and a calm voice. The safety and benefits of care given by midwives has been well documented in the research literature. Certified Nurse Midwives have a strong record of reducing rates of low-birth weight, prematurity, and neonatal death, as well as preventing complications. According to the American Journal of Obstetrics and Gynecology, “Mothers and babies have distinctly better than average outcomes when births are attended by midwives.” (1993). Midwifery care and services are covered by most major insurances including HMOs, indemnity plans, and Medicaid.